And a great dragon was cast out, that old serpent, called the Devil, and Satan, which deceiveth the whole world: he was cast out into the earth, and his angels were cast out with him. Will Restorative Justice Play a Role in former Pompano Beach High School Student’s Death? Tallahassee, FL—Since the early November 2017 death of 20-year-old, Andrew Coffey, a former Pompano Beach High School student, nine members of Pi Kappa Phi at Florida State University has been charged with felony hazing. At the time of Mr. Coffey’s death, he was in his junior year at Florida State University, as well as a pledge with Pi Kappa Phi. According to a Sun Sentinel online article entitled ‘Death of frat pledge from South Florida leads to hazing charges for 9,’ by Joe Reedy, The Associated Press, “The state medical examiner said Coffey had a blood alcohol level of .447 at the time of the autopsy. Unfortunately, Mr. Coffey’s parents call for “more accountability” echoes what more than sixty percent of Tallahassee’s citizens have been seeking from members of their local government for more than a decade. Many citizens know that Jack Campbell has yet to be held accountable for his unlawful actions while working under former State Attorney Willie Meggs. In some instances, Jack Campbell, who was an assistant state attorney, was being spoon fed criminal cases that were under the investigative jurisdiction of Leon County Sheriff Larry Campbell. In spite of Willie Meggs having over forty assistant state attorneys in his office, Jack Campbell would receive high profile cases that his dad (Sheriff Larry Campbell) was investigating. Although many local defense attorneys argued “conflict of interest,” their arguments fell on deaf ears. 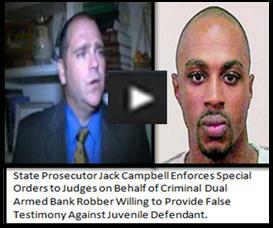 Many of the presiding judges had been former employees of Mr. Meggs; and colleagues of Jack Campbell. The reach to ensure Jack Campbell scored convictions was not long at all. With Leon County Sheriff’s deputies and detectives testifying in court before their boss’ son; and the judge presiding over the case having been groomed by Mr. Meggs as well as having once worked with Jack Campbell—in the eyes of those within Tallahassee’s judicial system it was a win, win situation. However, in the eyes of the defendants, the defendants’ family members, and the eyes of some defense attorneys it was unethical, immoral, and disgusting. Several Leon County Sheriff’s deputies and detectives openly committed perjury, along with a medical examiner. In doing so, deputies, detectives and the medical examiner had no fear of being charged with perjury because charges could only be brought about at the state attorney’s discretion. In one known case, Jack Campbell and his dad allowed their family friend to impersonate a law enforcement official—with the impersonator’s information going before a grand jury in order to obtain an indictment against a 17-year-old, Black male, who was a freshman at Tallahassee Community College. To highlight Willie Meggs and Jack Campbell’s careers in Florida’s 2nd Judicial Circuit, Meggs gave the green light for Jack Campbell to use Restorative Justice during the prosecution of a murderer—it was the first time ever Restorative Justice had been used in a murder case. While the female victim’s parents may have been in the dark about their daughter having been repeatedly abused by her boyfriend before he took her life, Meggs and the Campbell’s were well informed about it all. And despite the victim being dead, Restorative Justice prevailed. Sheriff Larry Campbell, the overseer of the Leon County Jail, violated numerous jail safety measures—putting many of his own staff members, inmates and civilian lives in jeopardy. Everyone who is not under the umbrella of Meggs and the Campbell’s are considered worthless. Whenever Meggs and the Campbell’s want to “grandstand” they will step on anyone. Jack Campbell is now state attorney in the same office as Meggs once held. He was trained to step on lives at all cost. Jack Campbell stepped on the life of a nineteen-year-old white female victim of domestic violence. Willie Meggs and the Campbell’s treated her murderer as if he’d vandalized school property. So, now, what would stop Jack Campbell from stepping on the life of 20-year-old, Andrew Coffey via Restorative Justice? Note: According to WCTV.TV , in September 2014, when Leon County Sheriff’s Deputy Neeley Knight was physically assaulted by Shane Maxwell, neither Leon County Sheriff Larry Campbell nor State Attorney Willie Meggs speak of considering Restorative Justice as a part of Mr. Maxwell’s case. Why? Because Deputy Neeley Knight is the daughter of State Attorney Willie Meggs. So, Willie Meggs consulting his daughter about forgiveness (as he’d previously done in the cold-blooded murder case discussed earlier), he contacted Governor Rick Scott and asked that a special prosecutor handle the case citing conflict of interest. Mr. Maxwell’s case was reassigned to Brad King, Florida’s Fifth Circuit State Attorney. In October 2015 Shane Maxwell was sentenced to more than 40 years in prison. Mr. Maxwell’s prison sentence is twice as many years than the man that killed Ms. Ann in cold-blood. Author MAUL10Posted on January 29, 2018 January 31, 2018 Leave a comment on Will Restorative Justice Play a Role in former Pompano Beach High School Student’s Death? Tallahassee, FL—On the evening of January 16, 2018, as Civil Rights Activist, Angela Davis received a standing ovation inside of the Ruby Diamond Auditorium located on the campus of Florida State University near downtown Tallahassee, a young Black male by the name of Henry Segura, was just blocks away inside of the Leon County Jail—where he has been for nearly a decade—as a group of white court officials within Florida’s Second Judicial Circuit strive exceedingly to have Mr. Segura sent to Florida’s Death Row in spite of severely lacking evidence which eventually led to a mistrial. However, despite of the mistrial, Mr. Segura was sent back to the Leon County Jail without a bond—which further underscores the EVIL that is embedded inside of some of the court officials who will rather see INNOCENT BLACK BOYS & BLACK MEN sent into Florida’s Prison System for LIFE or to DEATH ROW—before seeing BLACK BOYS & BLACK MEN getting educated or working on honest jobs. For more than a decade, The Florida Bar Association has been coddling Jack Campbell, who was working as an assistant state attorney directly under State Attorney Willie Meggs, before being elected to replace Meggs. As an assistant state attorney, and now as state attorney, Jack Campbell has been working against Mr. Segura. Jack Campbell, whose dad was Leon County Sheriff Larry Campbell, was being spoon fed criminal cases to prosecute—cases that were directly under the investigative jurisdiction of his dad—while court officials played their roles to ensure Jack Campbell’s successful convictions; while The Florida Bar continues to decline to properly address complaints that have been filed against Jack Campbell for his illegal acts. In 2011, Jack Campbell filed a Summary of Offense and Probable Cause Affidavit for Two Counts of First Degree Murder against DeShon Thomas. The charging affidavit was signed by Leon County Judge Nina Ashenafi-Richardson. Judge Richardson, whom struggled to get judgeship due to controversy regarding her expunged record, is a Black woman, whom may have trusted every document that was placed in front her. Judge Richardson may have not known that the Summary of Offense and Probable Cause Affidavit for Two Counts of First Degree Murder had been drafted and signed by a wealthy close family friend of Jack Campbell and his dad. The Campbell’s family friend, Don Odham a.k.a Leon County Sheriff’s Detective Donald Odham, a white man, was placed as lead detective on the double murder case that charged 17-year-old, DeShon Thomas, with the murders of 20-year-old, Laqecia Herring (who was pregnant) and her 17-year-old brother, Sterling Conner Jr. At the time of the murders, DeShon was in his 3rd semester as a freshman at Tallahassee Community College and an employee at Taco Bell. In 2013, when DeShon went on trial, was when DeShon and his family learned that Don Odham was never an employee with the Leon County Sheriff’s Office—in spite of having notarized documents that had been filed with the Leon County Clerk of Courts describing him as an employee with the Leon County Sheriff’s Office. It remains unclear if “Detective” Don Odham testified before a grand jury in order for Georgia Cappleman to have obtain an indictment against DeShon. But it is very clear that without “Detective” Don Odham there would have never been the arrest of DeShon Thomas. Instead of former Leon County Sheriff Larry Campbell and former State Attorney Willie Meggs instructung their employees to solve cases by following facts and evidence, they apparently instructed them to solve cases by manipulatung and intimidating people directly or indirectly known by their suspect or suspects. DeShon Thomas and Henry Segura are just two cases in Tallahassee where gross misconduct by white court officials have been disgustingly ignored by local state officials. There are far too many systems in Tallahassee that function under a “Cult-like” mentality or “Ku Klux Klan”—particularly Leon County/ Tallahassee’s judicial system. Tallahassee’s current Mayor Andrew Gillum, a Black man, who is also seeking to be Florida’s next governor, is an alumni of Florida A & M University and a former member of City of Tallahassee Board of Commissioners. Yet, it was during Mr. Gillum’s time as a commissioner when Black students attending colleges and universities in Tallahassee voiced their fears of local law enforcement officials. In 2014, less than a year after DeShon’s conviction, the non-profit Massachusetts based organization, RepresentUs, helped sail the City of Tallahassee into becoming the nation’s first city to pass the American Anti-Corruption Act with votes of over 60% of Tallahassee citizens. With an overwhelmingly amount of Tallahassee citizens fail to trust their own local government officials, coupled with Tallahassee’s high crime rate, it would not be in the best interest of any Black child seeking post-secondary education to enter into such a HIGHLY TOXIC ENVIRONMENT until State Attorney Jack Campbell and other officials are held accountable for their illegal acts against Black boys and men.